he 1991 U.S. Supreme Court decision in Feist Publications v. Rural Telephone Service Company, Inc. delivered was hailed both as a landmark decision and a legal bomb. Was Feist so original as to deserve all the attention? After all, it did not establish a new originality paradigm as such but only ended a long division among federal circuits concerning the protection under copyright of factual compilations. A number of circuits had adopted a test similar to the one articulated in Feist (i.e., based on creative selection), while others required only evidence of labor, a test known as sweat of the brow. In reality, Feist did much more than resolve a definitional tension: it determined that there was a constitutional requirement of creativity. According to the U.S. database industry, the sky had fallen: factual compilations would no longer be protected and without adequate protection, investments necessary for the creation and maintenance of databases would dry up. That did not happen, even though debates concerning a federal tort of misappropriation continue. 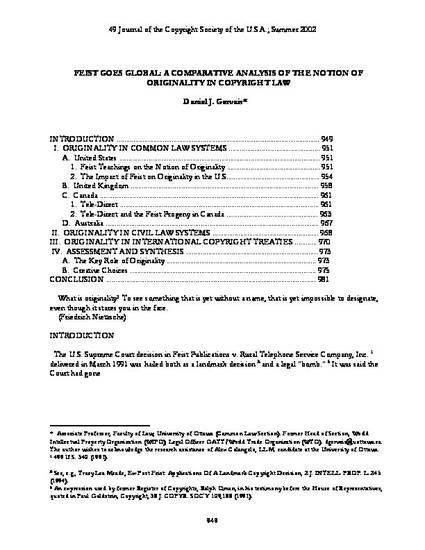 The purpose of this article is not to analyze whether Feist was correctly decided, but rather to show that a Feist like standard is now applied or may soon emerge in key common law countries. Moreover, in a move that may bridge the gap between the two major systems of copyright, we will demonstrate that civil law systems have also adopted a similar doctrine.